Bridge the Distance: Have LASIK Wherever you May Be! You are here: Home / Promos & Offers / Bridge the Distance: Have LASIK Wherever you May Be! Looking to have your LASIK but is too far from our clinics? No more worries, the perfect vision that you envision can be within your reach. Let’s make your dream LASIK procedure a reality! 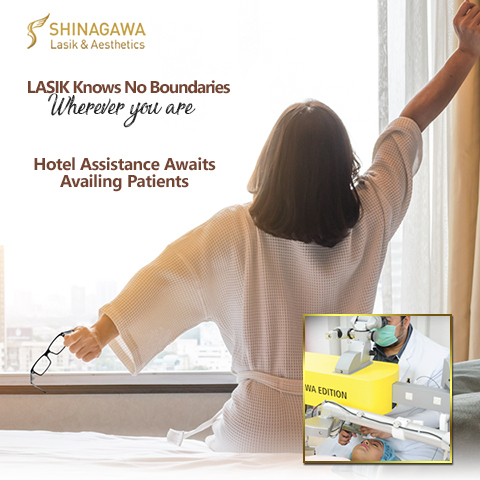 Shinagawa will likewise guide you through to make this happen as we can provide you hotel assistance and special discounted accommodation rates from our partners to aid your journey to perfect vision. Near, far, wherever you are, Shinagawa will get you covered. Let’s make your LASIK happen! Our goal is for you to have the utmost convenience in finally having LASIK wherever you may be. We’re looking forward to being your bridge on your way to perfect vision. For more inquiries and interest, contact our Patient Care Lines: (+632) 368 5238 l (+63) 917 862 7454 l (+63) 921 217 0517. Let our LASIK consultants guide you every step of the way.